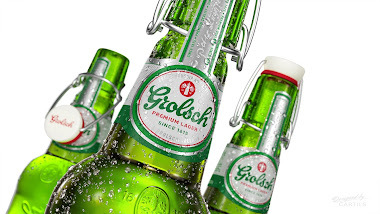 The Dutch Grolsch brewery was founded in 1615 and Grolsch beer has evolved into an international player within North European lagers. To bring the new brand platform ‘Unconventional by Tradition’ alive, Cartils was asked to redesign the primary and secondary packaging. A collaborative think tank with the target audience ‘the greenhouse’ has been taken along in the process; to generate ideas and energize the creative spirit. The key challenge for Cartils was to simplify and modernize yet stay recognisable as the strong legacy and authenticity of Grolsch is much appreciated. Developing a pack design, which is differentiating yet relevant. Freshness and standout were also important factors to take along whilst any feeling of artificiality needed to be avoided. Cartils simplified the logo design and made it more contemporary by removing the outline and shading effects and by using a more serious green. The red heritage mark has evolved to convey the Grolsch – unconventional by tradition – brand story: 2 hops and a swingtop. The icon is more prominent and has surprising elements of discovery. The circular main shape has been created; connecting to the past and to the origin of the swingtop. The circular shape is a simplified shape yet serious, with layered lines and storytelling details to emphasize premium (lager) cues. The white based colour is more refreshing and differentiated yet ensures beer-cues. The secondary packaging has increased in authenticity. The ‘Craftsmanship & artistry’ as well as ‘unconventional by tradition’ supporting texts have been added as a confirmation of the brands soul & spirit. The new design is rooted, connected to the past, showing 400 years of authenticity, but in an up-to-date interpretation.